All transactions are safe and secure with a reliable history in online purchasing behind each of our associates. 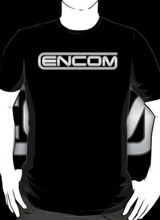 Buy the Encom t-shirt to own Tron clothing and merchandise. If you want to recognize the computer technology company responsible for Tron, then this ENCOM t-shirt fits the bill. ENCOM has evolved from its beginnings in defense systems during the seventies to a video game leader in the eighties, with the help of software engineer Kevin Flynn's creativity. Best known for hit video games like Space Paranoids and Light Cycles, it would seem that ENCOM couldn't survive without him. However, even after his disappearance, the company was able to sustain itself by using his previous ideas. Capture a Tron hoodie below or frisbee light disc as well. In addition to the Encom tee above, browse the Tron Clothing Gallery for more apparel like men's and women's clothes, kids shirts or hoodies.